For quite some time, Arcen Games has been committed to adding fan suggestions to AI War via general suggestions and our Community DLC poll in the AI War forums. In the case of Tidalis, today's new official version 1.005 of the game continues that trend by including 12 new player-created levels, several bits of player-created art, a new player-suggested VS game mode, and a number of other updates and tweaks based on player suggestions. So what's this contest, then? Well, it's pretty simple: if you have ideas for new mechanics that you'd like to see in the game, submit them in our Tidalis Suggestions forum. We'd most like to see new block ideas, but if you have ideas for new game modes, VS rulesets, or similar, those are also welcome. Approximately every two months, we'll select one or more entries to actually implement into the game, with art and sound effects as needed, and with your name (or forum handle if you prefer to remain anonymous) featured in the release notes as well as the game credits. Best of all, this is a contest where everybody wins, because all existing Tidalis customers always get these sorts of "free DLC" updates... for free. Not much of one for gameplay design? That's okay -- if you're into level or brainteaser creation, you might prefer to simply submit your custom levels for potential inclusion in the free DLC. Twelve player levels have already become a part of the official release versions of Tidalis, and yours could be next. Here again, we give full credit based on your name or forum handle (your preference). A lot of games have community mods or levels, but what we're offering is a chance to affect the actual core official game, not just an obscure addon. At Arcen, we really believe that players are full of good ideas, and we've seen the frustration that many people have with their inability to see anything come of those ideas with the larger companies. 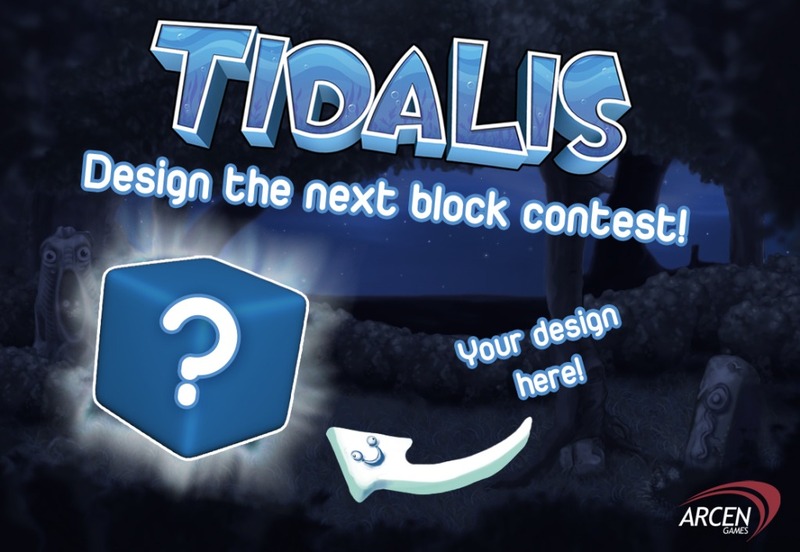 With AI War we were so inundated with suggestions that we had to institute the Community DLC poll, and now with Tidalis we're going to handle it a bit differently with this bimonthly Design A Block contest. I'd like to nominate one of my Chromatic Blocks ideas, specifically the Color Shift block. I do think those are pretty cool, but the main challenges are that they would be not colorblind friendly, which would be a big barrier, and they're also the sort of thing that would require people to remember color relationships, which most people are very bad at. I think it's interesting, and very clever, but it requires certain styles of vision and semi-obscure knowledge, which would be a blocker. Don't worry about nominating suggestions, anyway -- if it's in the suggestions forum, we're considering it! I still like the idea of your Infinite Loop game mode in particular, and would like to do something with that, possibly in this next free DLC batch or possibly a bit later. Multiple submissions are cool, too, for those who are wondering. Similar, but oh so different: Rainbow Blocks. I have posted three new block ideas. Thanks, guys! Looking great! Right now we're collecting ideas and not making any decisions yet, but we'll make decisions on which to include shortly before each free DLC release, when we have the full slate of ideas to pull from.